In molecular biology, when we cut and paste DNA together and then let the bacterium E. coli replicate and propagate that piece of DNA. The goal is to isolate a single colony that contains the DNA construct of interest, usually a plasmid containing an insert with your favorite gene. This is a case of isolation being a good thing. In science, isolating the thing that’s causing the other thing is often the goal. Get rid of the noise and find the signal. The opposite is true for humans. I wrote a few weeks ago about feeling isolated. I have been thinking more and more about why that’s a problem for me, specifically (it might seem quite obvious, I realize). Dealing with stress: I found this TED talk from Kelly McGonigal interesting. Stress can be good for you in part if you think it is and also in part because it can cause outreach to others. The problem for me is that having those immediate people to reach out to don’t exist (yes, I can and do email and talk to my friends who live far away). This keeps my stress mostly bottled up. Energy: I find that even for me, the introvert who needs time alone to recharge, being with people I like and am close to is in fact energizing. If I’m by myself, I find that I get run down more easily, I won’t push myself as much. Determination/Inspiration: If you’re a runner, you may know the phenomenon that running in a group seems to improve performance. It’s simply being around other people that helps. Serendipity: Interesting and sometimes messy things happen when people get together. In my overly isolated life, those things don’t happen as often. Be it business opportunity, dating, whatever, it just doesn’t come along as often. And again, some of this can be done over the Internet. Twitter is full of this kind of interaction, but again, it doesn’t substitute fully for real-life interaction. Lack of feedback: Again, something the internet can help with, but isolation means that I feel like I’m in my head too much and can second guess myself like a champ. And it’s not just feedback that ‘you’re becoming reclusive and weird’, it could be positive feedback as well. I’m not saying that being alone is a problem all the time, but humans aren’t meant to be isolated. I think ‘Doctor Who’ explores this with The Doctor quite a bit; he’s better off with a companion and can go off the rails without them. Author Ian StreetPosted on November 2, 2013 Categories 2013, brain state, Change, depression, disconnection, Doctor Who, Engage, Ian 3.0, Introversion, mindfulness., my brain, postdoc experience, science, science culture, shyness, socializing, vulnerabilityTags Biology, DNA, Health, Isolation, Kelly McGonigal, Mental health, Positive feedback, TED, TwitterLeave a comment on Subclone. This episode ‘Homer’s Enemy’ has been on my mind lately. In the episode, Homer is put up against Frank Grimes, a man ‘who’s done everything right’, taken all the right steps and moved up into a steady job at the nuclear power plant in Springfield. And Homer sort of lucked into being the safety inspector in sector 7G. If you watch the show, Homer has also had any number of crazy experiences in his life, including winning a grammy when his singing group, the B-sharps, hit it big. ‘Grimey’ is a very straight arrow, stays on the pre-laid path. He does what’s ‘expected’ by society- education, get a decent job and just do that. Forever. There’s some comfort in that. Homer is the opposite. Living in the moment, doing what feels good for him in the moment, pursuing what he wants, leaning into the uncertainties of life- in large part because he doesn’t know any better. I am much more like Frank Grimes. Standard. Straight. Narrow. And decidedly not a risk taker. I wish I was a bit more like Homer- a more competent at his job, perhaps, but someone who lives more in the moment and enjoys his time more…spending more time blogging perhaps, doing more creative things with my time. 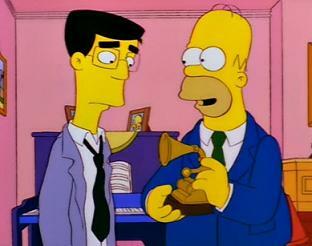 Oh, and Homer, of course has a family….Frank Grimes doesn’t. It all suggests that leaping in with both feet, while no guarantee, means interesting things will happen to you if you take the plunge. I don’t plunge enough. Nick Offerman, Ron Swanson himself was on The Nerdist this week and talked about what it is to be a man (really, just a decent human being). Hard work. Empathy. Being authentic. Be humble. Be a lifelong student. And apologizing when you’re wrong. Being comfortable with yourself. Feeling like your work is a privilege. Owning your story. Something I’ve talked about a lot before. I am trying to plunge in more in my life and enjoy the adventure, rather than hiding myself away. I don’t fully know what that means. But it at least means forcing myself to do the things that I am uncomfortable with. In the lab, in teaching, in life. Which is a lot. Venturing out when I’ve kept myself closed off for so long. It’s hard making it out of the dark forest. I have taken some steps in the right direction I think, though they seem so small and insignificant that I am still feeling like a failure at life. I know I’m still relatively young, but there’s a point where I have to say ‘I’m not where I want’…I just don’t know what or who to ask to change it all. But I’m asking my bumbling, stupid and slow questions, challenging myself in stupid ways and writing…which I’m told is a great way to learn what you think and find solutions to problems. Author Ian StreetPosted on March 28, 2013 March 28, 2013 Format LinkCategories 'I'm Fine Thanks', 2013, ask, brain state, career, Change, Daring Greatly, depression, UncategorizedTags Daring Greatly, Ian3.0Leave a comment on Grimey. I’m no good. I’m embarrassed to even be walking the Earth. I want to get run over by a bus. I want to crawl under a rock and stay there. I don’t want to talk to anyone. Or make eye contact. Or talk to them. Or declare my presence. I am an impostor. Anxiety boils over in my head. I am extremely perfectionist. I am neurotic. Why bother investing in myself? Nothing will work out for me no matter what I do. I question and ruminate on every decision I make no matter how insignificant. I don’t love myself. Rationally, I know there are people who care about me, but I don’t know why. I know I’m better off than many, but still feel awful about it. Truly, the world would be better off without me. I don’t matter. Or count. I’m useless. Things can’t possibly change. I’m too…old, set in my ways, don’t know what I’m doing, uncertain, indecisive, asocial…I am wrong. A mistake. I am doing more. I am in the arena a little more often. I have accepted my my introverted nature and understand more that it’s not a flaw, just a part of who I am. I am inching my way back up to feeling like it’s OK for me to live life. Doing something. Or at least trying to. I still don’t have a good direction to go in. I am trying to prevent career burnout by doing things for myself that are novel and new. And enjoyable. I am exploring slightly more. And through this blog, commenting on things through Twitter (my tweets made it onto the #Sciquester home page the AAAS had! ), emailing people and asking for the things I need more often. I try to do something that will make me uncomfortable every day…I even succeed sometimes. I have noticed this myself. When I write, or speak to people, I still come from a perspective that I don’t have a clue and am not confident. While it’s true that I don’t feel I have a ton of confidence, I do try to have a more confident voice. I go back and edit things I write when I see equivocations in my writing whenever I see them. I’m sure I do a lot of that here in this blog (I’m doing it right now…), but this is meant to be fairly quick and informal writing. I am taking enjoyment in things a bit more. However, I am not engaged in my work. The idea of doing something else is still strong in my head (this economy scares me still- no more middle class apparently…). I am slowly being swallowed and stifled by my scientific career and feel I need something else to lead a meaningful life (having a significant other is a long standing goal of mine still). I just feel largely lifeless when I’m working. I like science, but the career prospects to stay in it are absolutely dismal. It keeps me up at night sometimes. 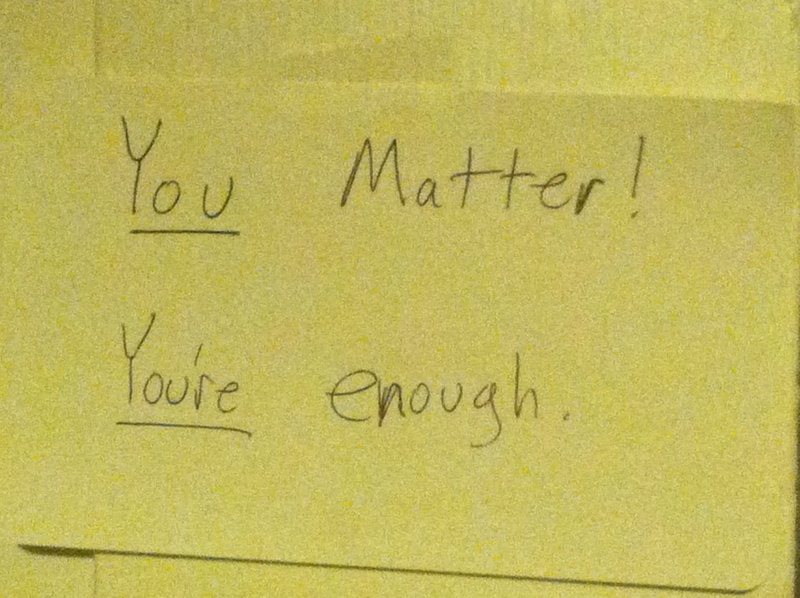 I am having more compassion for myself as well. Not that I feel like everything I’m doing is OK, but being kind to myself helps me recover from set backs. Things I have done so far that make me uncomfortable are actually looking more into my finances, setting up a newish home network, learning and trying new things in the lab, talking more (even though my voice sounds weird when I am more extroverted…and feels like someone else talking entirely), I am using more tools to help organize myself- like doing a weekly review, using Evernote (awesome! ), and Unclutter to keep my desktop clear. I am continuing to learn about myself- reading about High sensitivity (pretty sure that fits me well) and learning more about will power/habit formation and trying to learn good ones. And continue to be more mindful. I want to be bolder. Take more chances. Make more mistakes- and hopefully learn more from trying rather than reading theoretically about how something works. Not over thinking, which is still very much a habit of mine. I would love to just decide something and do it. Right then. And not be so afraid to spend money on things I want because I fear buying stupid things. And of course, I hope a major life change comes soon and I can truly announce the release of Ian 3.0. Author Ian StreetPosted on March 17, 2013 March 25, 2013 Categories 'I'm Fine Thanks', brain state, changing outlook, depression, Ian 3.0, impostor syndrome, Introversion, mindfulness., perfectionism, Philosohpy of science, postdoc experience, shyness, vulnerability1 Comment on Self talk.